During the last couple of weeks Southern CA was invaded! But, it's been a wonderful invasion. Over a million Painted Lady butterflies had left the deserts of Mexico and were flying to Oregon where their breeding grounds are located. It was an amazing sight to see: swarms of butterflies were EVERYWHERE! They were somewhat difficult to see individually because they were the size of a silver dollar and moving VERY fast. I was driving along Pacific Coast Highway right along the beach and had to slow down because I didn't want to hit any of them. I would have been sad if one had gotten killed on my windshield! Imagine all their work to fly up from Mexico only to land on the windshield of a car in Southern CA! Mother Nature can certainly put on some beautiful shows, and this was indeed one of them. I decided to honor this magical influx by creating a table filled with whatever butterflies I had in my dish collection. I started with brightly colored placemats I found at Pier One. They sing "spring" to me and I thought they were a good way to anchor my settings. I could see butterflies being attracted to the color and patterns! I thought my burlap chargers would be a good way to start my dish stack. It's a natural fiber and works well with a nature theme. I had trouble choosing whether to use a purple dinner plate or my favorite chartreuse green dinner plate, so I decided to use both! I'll let you decide which one works better with my salad plates that I'll be showing you next. Here is a salad plate I found at Pier One a long time ago. I've been waiting to find the right time to use it. Turns out it is perfect for a post celebrating the Blissful Beautiful Butterflies that swarmed around So. CA this week. I then chose the napkins that match the placemats. My favorite accent for this place setting is the butterfly napkin ring I found at Pier One when I first started tablescaping. I love its size, its colors and bling that it brings to a spring table! It's perfect for today's table! I completed the place setting with gold-plated flatware on loan from my cousin. I felt the gold would highlight the yellows in the setting. I added purple goblets that I found at Old World Market. They also complement the purple in the salad plates. I decided to keep my centerpiece fairly simple. I discovered I had two teapots that highlighted butterflies, along with matching teacups. 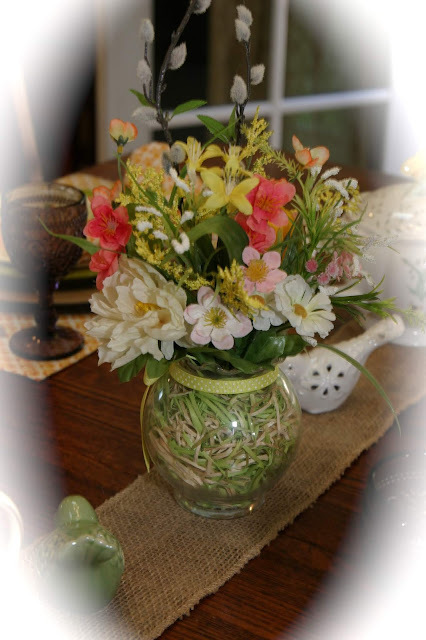 I also chose to use the beautiful vase of faux flowers that my cousin kindly made for me to use on my spring tables. Thank you, Karen! I added some porcelain birds to enhance the springtime theme and let the elements rest on a burlap banner. It adds some natural texture and also matches the chargers I'm using. This particular teapot and cup and saucer is by Burton + Burton and its pattern is called Morning Meadow. This teapot and cup and saucer are from my collection of Lenox china and the pattern is Butterfly Meadow. It's a popular pattern and graces my table as soon as spring arrives! Please note the butterfly handle on the teacup! I must add that both these teapots and cups and saucers were given to me by my Hubby! He certainly knows how to make my day! I enjoyed putting this table together. When I revisit this post, I'll remember how special it was to be a witness to the " Painted Ladies Migration". I hope they had a safe time on their journey and have made their way to Oregon! I'll be linking up to Susan's Tablescape Thursday at www.betweennapsontheporch.net and Christine's Dishing It! and Digging It! at www.rustic-refined.com. It's always fun to check out these sites and see all the creativity out there! I thank you for your comments and appreciate them all!! Happy St. Patty's Day! I love the hobby of tablescaping, and I have a closet full of dishes and accessories in my den/office that reflect my love of the hobby and all things porcelain, china, pottery, crystal and glass. To celebrate March 17th, I decided to use components of all different shades of green so that some pieces I haven't used before (or, in a very long time), could be showcased. I started with a square woven- weave placemat that I found at HomeGoods. I love its shamrock green color. I anchored my plate stack with a jade-colored charger I found while antiquing in Ojai, CA. I'm not sure what material they are made from. Could it be jadeite or would that be prohibitive for use in dinnerware? I absolutely LOVE this charger, and wish that I had an opportunity to use it more frequently. I've become more casual in my dinner table habits since retirement, and rarely use full dish stacks, except at holidays when the family comes over. I decided to separate layers with shamrock-printed towels from Dollar Tree. They're large to use as napkins, but a hearty meal of corned beef and cabbage can sometimes get messy! Next came my loyal white Metaceramica Portuguese plates found at HomeGoods. To top off the stack I chose some of my favorite canape plates. They are from Mikasa, and labeled Antique Countryside Pear. I found these on a sale table at Macy's. I love the scrollwork on the border, the scalloped shape , and sweet picture on the plate. The green on the picture is more chartreuse than kelly, but it's my favorite shade of green. To complete my place setting I chose green flatware that I found at CVS pharmacy, and some cute shamrock-patterned glasses I found at Shinoda Design Center. 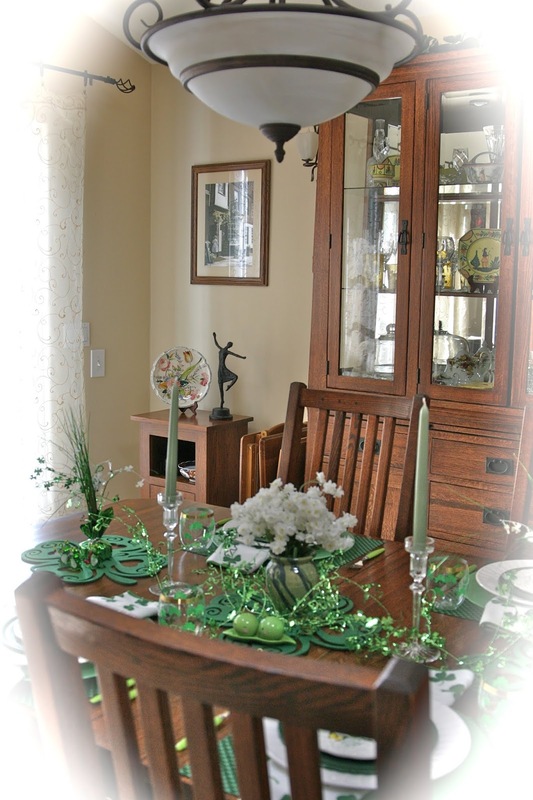 For my centerpiece I chose some other green items I found. I used shamrock-shaped felt placemats from the Dollar Tree to start; then I anchored it with my pottery vase (note the shades of green in its design), filled it with white faux flowers, then flanked it with crystal candleholders and soft green candles. A St. Patty's spray and some favorite glass frogs from my hubby's frog collection complete the centerpiece that I wrapped in St. Patty's wire wrap. The final addition to my table was my green salt and pepper set. This adorable "pea pod" set was a gift to me from my stepdaughter, and it always puts a smile on my face when I use it! I'm singing in a Choral Concert on Sunday, so I won't be cooking on St. Patrick's Day, but it was fun to imagine what the table would look like if we were celebrating! Enjoy your St. Patrick's Day!! I'll be linking up to Christine's Dishing It! and Digging It! party at www.rustic-refined.com. Please go over and enjoy the party! I love to read your comments, and I appreciate your thoughts! I started with a yellow placemat that I had found at HomeGoods. I love the appliques on these mats. They seem perfect for a Spring table. My dish stack started with these Chinoiserie plates I found at HomeGoods a few years ago. I liked them so much, I purchased 4 dinner plates, 4 salad plates, a pitcher and a small tray: all in the same pattern. It meant that I had to travel to 3 different HomeGoods stores, but I got the pieces I wanted. They were definitely calling to me from my dish storage closet when I got started creating my table today! I topped the plate stack with blue linen napkins found at Old World Market, as well as floral napkin rings I found there. I've always loved the color combination of yellow and blue, and it seems perfect for a spring table! I finished the place setting with my late mother-in-law's International Silverplate that I was gifted. I love this pattern, called Heritage . I then decided my table would be set for a champagne luncheon, so I added crystal champagne "boats" I found in an antique store in Clovis, CA. I love the delicate floral pattern that wraps around the boat. My centerpiece started out with the matching rectangular tray. I then found some blue and yellow faux flowers and placed them in the matching pitcher. The ceramic chinoiserie balls came from an antiquing expedition I went on with my niece when we were visiting Yardley, PA. Hi, Patty! I extended the look of the centerpiece with blue tapers that are sitting in sweet glass taper holders I found in an Animal Rescue Gift Shop in Ventura, CA. I love the shape of these holders. They look like glass flowers: if you look closely, you can see the petals of the flower. It's raining again today! California needed all this rain to help end our extended drought, but I'll be glad when our skies are blue again and the sun in shining. I think I'll leave this table up for a couple of days to remind me that Spring will soon be here! I'll be linking up to Susan's www.betweennapsontheporch.net for Tablescape Thursday and Christine's Dishing It! and Digging It! at www.rustic-refined.com. Please visit these sites to enjoy some wonderful creativity! Thank you, Ladies, for hosting these parties. When we take out our motorhome, we try to find the local antique stores that are available near our campground. Not too long ago when we were visiting Bishop, CA, we found some fun antiquing possibilities. Today, I created a tablescape that shows off the dishes I found on this past trip. The next layer consists of my ever faithful yellow Metaceramica dinner plates from HomeGoods. The top layer showcases the new salad plates that I found while antiquing. I love the fall colors it presents and the many happy flowers dancing across the plates. I also have a soft spot in my heart for scalloped borders on plates! The plates are labeled Copeland Spode, Great Britain, Gainsborough. I used gold-plated flatware on loan from my cousin, Karen in the place setting. I felt it coordinated well with the yellow color I wanted to accent. The wheat-colored napkins bordered in burgundy velvet are from Pier One and their color, along with the burgundy and yellow napkin rings mirror the colors found on the plates. I realized after I finished photographing my table that I had forgotten glasses for this post!! Try to imagine my Thanksgiving goblets rimmed in brown leaf borders around the top! My centerpiece is from Hobby Lobby and picks up the gold color I was highlighting in my place setting. It's a more formal look than I usually go for in a fall table, but I like how it looks with the tablecloth and dish stack. 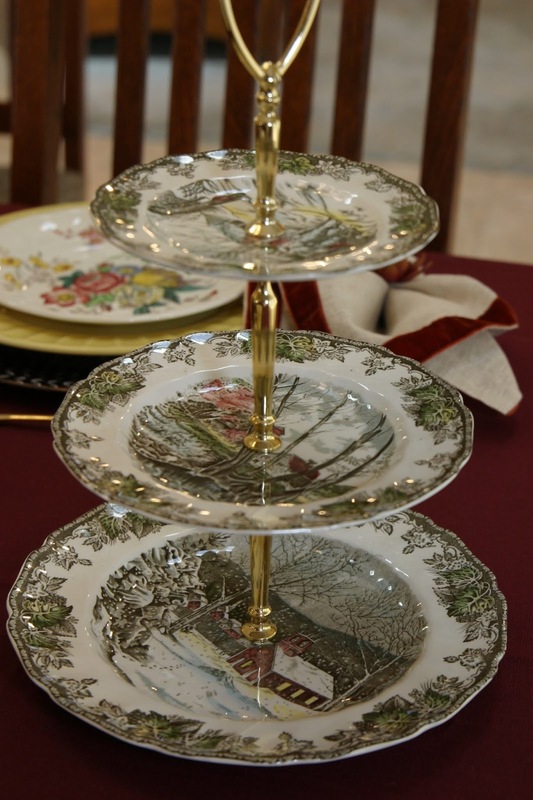 For accent pieces on the table, I've added a new 3-tiered server that I just purchased in my Johnson Bros. Friendly Village pattern. I also added 2 votive candleholders that I filled with "fall filler". I'm glad the weather out here is starting to cool down a bit, so that it really does feel like fall at night. I'll be linking up to Susan at www.betweennapsontheporch.net for her Tablescape Thursday and on Sunday, I'll be linking up to www.rustic-refined.com for Christine's Dishing It! and Digging It! Be sure and stop by these great link parties and enjoy all the creativity!! I read all your comments, and really appreciate them!